Welcome to Geohazards - earthquakes, landslides, tsunami. This field trip is supported by EQC (the Earthquake Commission). The field trip is from 28-30 April 2015. Enrol now. Get ready to explore parts of Marlborough, one of New Zealand's many geologically active areas. Experts will take you to remote locations to help you better understand what causes natural disasters such as tsunami, earthquakes and landslides, and how you can manage the risk of these events. New Zealand sits on the boundary between the moving Pacific and Indo Australian Plate. These plates continue to shape our amazing landscape, creating spectacular mountains, valleys and lakes. During this field trip you will discover the power of these geological forces as you look at the evidence left behind in the landscape of the Seddon Earthquakes, see active landslide areas and investigate the cause and effects of tsunami. This LEARNZ trip is the seventh in a series on geohazards that have included the Auckland volcanic field, Wellington and Canterbury Earthquakes and the Bay of Plenty. Watch the introductory video - 41Mb mp4 file. The South Island's Alpine Fault is a very distinct feature along most of its length. This is because the Southern Alps have been uplifted along their eastern side, making the fault clearly visible from space. The northern end of the Alpine Fault however splits into several parallel faults that spread out across the Marlborough region. There have been several recorded earthquakes in the region including in 1848 and 2013, and a tsunami in 1855. The Marlborough region is, not surprisingly, one of the most seismically active in New Zealand and a very good place to explore the nature of geohazards! Monday 27 April Read the diary about the travel day from Dunedin to Kaikōura to start the Geohazards field trip and see the panoramas. Read the ambassador updates. Read the diary about how the Kaikōura area has been shaped by tectonic forces. Watch the videos to find out more about earthquakes, tsunami and landslides. Read the ambassador updates. Get the questions and listen to the recordings of the audioconferences. Wednesday 29 April Watch the videos about active faults and tsunami risk in the Blenheim area. 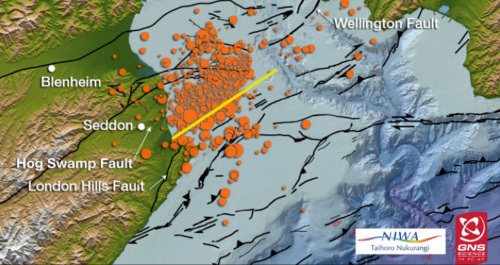 Read the diary to find out more about the Cook Strait earthquakes in 2013. Read the ambassador updates. Get the questions and listen to the recordings of the audioconferences. Thursday 30 April Read the diary about tsunami risk in Nelson and monitoring geohazards. Watch the videos to find out more about landslides in Nelson. Read the ambassador updates. Get the questions and listen the recordings of the audioconferences. Friday 24 April Newsletter 3 sent to all enrolled classes. The Geohazards background pages and their easy reading versions and student activities are now online. Tuesday 31 March The Geohazards field trip website is now online.